Wine of Spain. International Wine Challenge - Gold Medal 1989-1990-1992-1993-1994-1995-1996-1997-1999. A classic sweet Oloroso. Time, oak and the Pedro Ximenez grape in perfect harmony. Aromas of raisins, dates, spices and roasted coffee beans. ideal with dessert and mature cheeses. 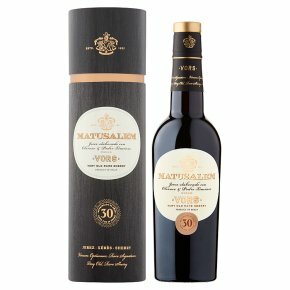 From 30 years of cask ageing, this classic Sweet Oloroso acquires not only its dark mahogany tone but intense aromas rich in nuts, dates, figs, raisins, overlain with old oak. Elegant, complex and intense on the palate. Excellent with pungent cheeses like Stilton, Cabrales, or fruit cakes and desserts. Serve at room temperature.